MORE often than not these days the name Tintin is followed by “racist”. Sure enough, in Tintin in the Congo, written in 1930 by the Belgian George Remi, Africans are depicted as submissive and simple minded. They often come across as not half as clever as Tintin’s companion, the dog Snowy. To contemporary sensibilities the cartoon character’s derring-dos in Africa are expressions of deep bigotry and typecasting. Now, with the release of Steven Spielberg’s 3D-animated film The Adventures of Tintin: The Secrets of the Unicorn, the cartoon racism debate has intensified again, with renewed calls for censorship and bans. British stores recently moved Tintin in the Congo from children’s shelves to adult graphic novel sections, and the publisher Egmont has wrapped the book in plastic and added a warning sign about its “offensive” content. Over in Lebanon, there have been some strong reactions to Tintin, too. But here the cartoon has been deemed as unpalatable for very different reasons. In one cinema, Spielberg’s name was blocked out from film posters. Apparently, Lebanese movie-goers need to be shielded from knowing that a Jewish man has been involved in the film they’re about to see. Both moves – the British censuring of Tintin in the Congo and the Lebanese censuring of The Adventures of Tintin poster – presume that audiences cannot be trusted to judge a piece of fiction on their own, but must be protected by censurers and coaxed into seeing it in a particular light. Whether it’s publishers censuring Tintin in the name of anti-racism or Lebanese cinema directors censuring it in the name of anti-Semitism, their impulses spring from the same place – it’s about not letting us judge for ourselves. There have even been calls to get rid of Tintin altogether. 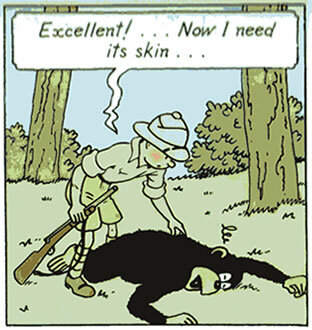 For instance, back in 2007 the UK Commission for Racial Equality claimed Tintin in the Congo depicted “hideous racial prejudice” and should be banned. In Belgium, a Congolese man’s campaign to get the book banned was recently rejected by the courts. No matter how much Remi’s drawings of big-lipped Africans jar with readers today, hiding his book, wrapping it in plastic and warning signs or, even worse, banning it, is an insult to us all. It sends a signal that we’re all feeble, highly impressionable simpletons who can’t decipher stereotypical cartoon figures from nuanced, real-life human beings, and that we can’t understand that the book’s content reflects the historical period in which it was written. Instead, we apparently need the likes of the CRE to re-write history for us and to simply obliterate any literary work it deems unacceptable. As for the Lebanese cinema managers, the fact that they simply taped a piece of paper to the poster that could easily be lifted to reveal Spielberg’s name shows just how little they think of their customers’ intelligence. Visit Nathalie Rothschild’s personal website here. Follow her on Twitter @n_rothschild.